A digital print is one that has been produced by a printer that uses digital information to print an image. In industry prints are produced on large format printers rather like an enormous colour printer, similar to those that we all use in the office. There are slow ones, which produce rotten blurred images, occasionally wrinkling and chewing the paper while others glide through the work seamlessly spitting out perfectly sharp renditions with beautiful colours. When someone asks me for a digital print what do they want? Usually they have not understood what we have just explained and mean a photographic image like these. 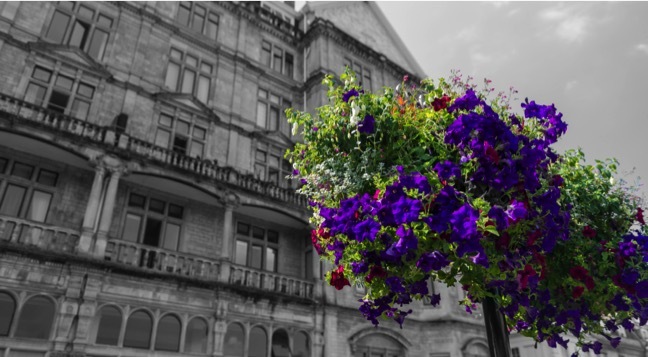 Beautiful as they are and ideal for printing digitally any image can be printed using this type of printing method and it offers many other advantages. Traditional methods of printing usually involve screens or cylinders, each corresponding to a different colour. 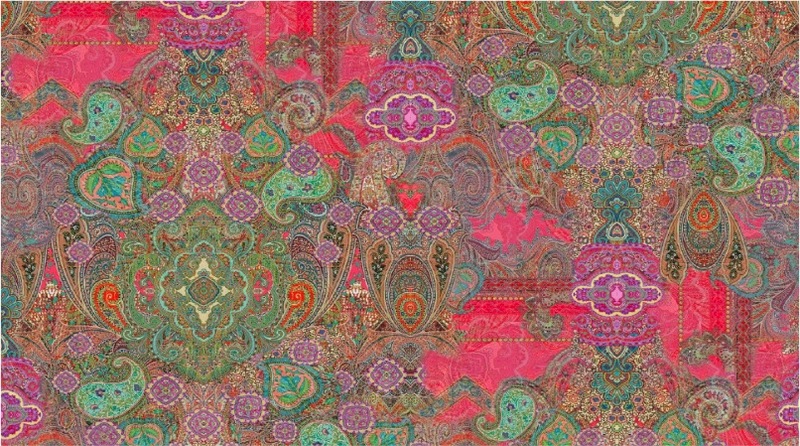 Designs are separated into a range of colours that are then combined to form a multi-layered coloured design. As you can imagine there is lots of preparation work done to achieve this plus the expense and time taken to make screens or cylinders. To set up a machine the cylinders must be collected, positioned and ink mixed and this may take hours. 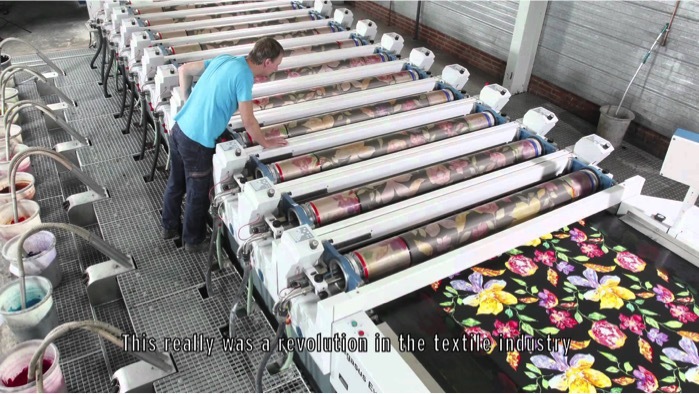 Often there are finishing processes after printing fabric directly. There is always an element of wastage as the machine is calibrated in order to start a print run and this is one reason is not cost effect to print short runs. Digital printing is applied direct to the material without the use of cylinders or screens as information is transferred directly from a design file. 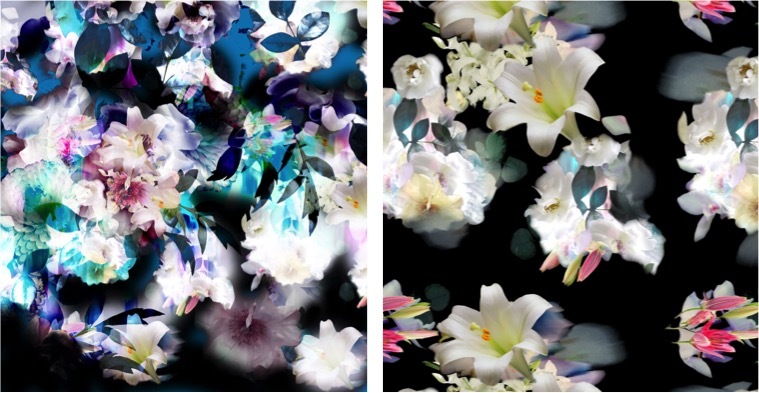 Typically the print is applied directly to fabric, paper, vinyl or films and widely used for textile applications, wall coverings and other decoration mediums. The width of the substrate determines the maximum horizontal print area but since we are printing rolled goods the length of repeat is near unrestricted. Designers are no longer restricted by cylinder or screen sizes circumferences and widths when building repeats. In traditional methods there are limits as to the number of colours that can be used dictated by the number of screens or cylinders. There are no such limits in digital printing. The design below from Sublitex could not be produced by any other way other than digital printing due to the extraordinary number of colours. There are small digital printing machines for smaller runs and sampling. More recently a new monster machine the MS LaRio, which runs at high speeds now competes with traditional printing methods but without the time consuming preparation and engraving costs. 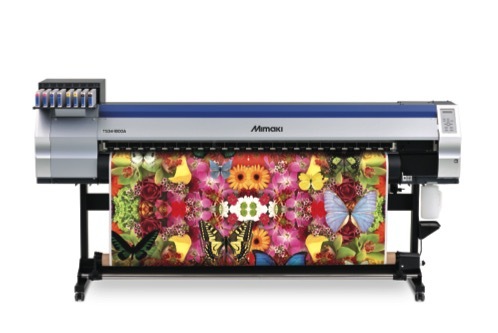 Design and Colour Ltd is proud to represent Sublitex Miroglio who have the first MS LaRio machine for printing Sublimation paper plus a wide range of other digital equipment. When should you consider Digital Printing? Digital printing is ideal for those needing a rapid response to the market demands or a unique product printed that was previously too costly to engrave.